Today I wanted to eat something that was close to healthy. So I went to CookingLight.com where I found the recipe for Rosemary-Fig Chicken with Port. It looked easy and I had all the ingredients in the house. Even the nutritional information at the end of the recipe looked okay. It was delicious. 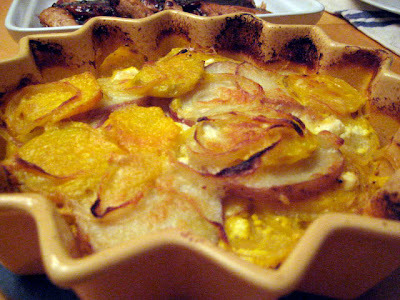 I made the Golden Beet, Goat Cheese & Potato Gratin from A nod is a good as a wink to a blind horse blog. I had made this one other time but this time I had the Golden Beets (Whole Foods Market!). It was perfect with the chicken dish. I am going to have and try that gratin recipe. I do not like beets, but I love beet greens. I think that this recipe might just change my mind. Thank you so very much for your kind words. They really meant a lot to me. The chicken with port looks delicious. Have a Happy New Year.